With more than 300,000 species of beetles in the world, it's no surprise that the insects come in a rainbow of shapes, colors and sizes. Beetles can be found living in just about any type of environment including under rocks, inside gardens, on trees and even in freshwater. About 30,000 beetle species live in North America. Like most insects, beetles have a head, thorax, abdomen and six legs. They come in various colors, but are most often black and brown. Beetles also generally have a thick, shiny shell that protects them from predators and harsh elements. Beetle wings are unique from those of other insects that fly. Beetles have forewings that are heavy and horny throughout, meeting in a straight line along the rear. In most species, the forewings protect a set of inner wings, which are thin and membranous. When flying, the beetle lifts its forewings and unfolds the hindwings. Beetles also have strong jaws and chewing mouthparts. Beetles' ability to adapt to various temperatures and conditions enables the insects to live in various habitats. Some beetle species can be found in deserts and dry areas, while other species live in rainforests, grasslands and cold environments. Beetles have also been known to exist on mountains and inside lakes and streams. Many species of beetles live inside tree bark or along leaves. However, beetles are not found in saltwater or in the polar regions. Most beetles consume plant bits, leaves, seeds and fruit. Some species eat smaller insects like gnats, while others feed on fungus and dung. Many beetle species eat bark and wood, leading to the destruction of trees. For example, bark beetles burrow into tree bark and kill such trees as junipers, redwoods and conifers. May beetles and Japanese beetles devour farm crops and leaves. 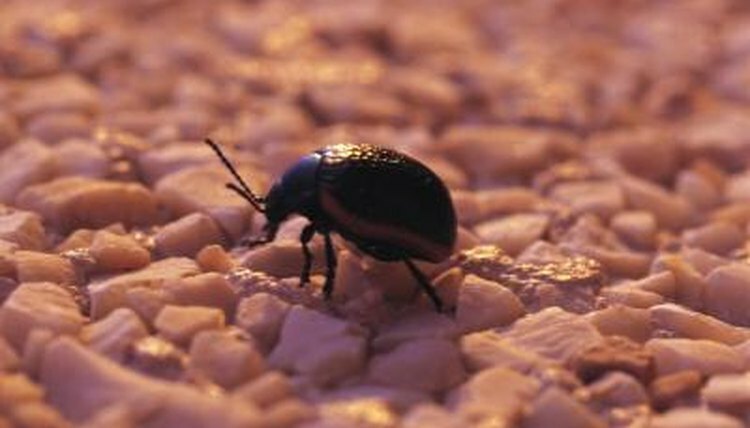 Drugstore beetles infest stored products such as flour and dry mixes and have even been known to feed on medications and toxins such as strychnine powder. Beetles differ significantly in size. Some species reach only 1/16 of an inch, while other can grow to nearly 6 inches long. The goliath beetle, for example, is the heaviest beetle recorded, weighing at more than 2 pounds. The elephant beetle is another large species, generally growing to nearly 3 inches long. Conversely, beetles such as the red flour beetle and the rice weevil are barely 1/8 of an inch long. Tropical beetles and those that live in warm climates are generally larger than species in cooler climates. Beetles develop through four different stages called a metamorphosis. The life cycle starts in the spring or early summer when a female beetle lays eggs, which hatch into larvae. The larvae, or grubs, feed off ground matter such as grass and eventually become pupas. During the pupal stage, the insect creates a cocoon around itself while its legs, wings and body develops. After several months, the pupa becomes fully grown and an adult beetle emerges.